You need to place you drive on the left side of the fairway. ALL trees are in play which means that you can't go over them. You'll need to curl around so use a driver with a lot of curl comined with a ball with distance and sidespin. Don't forget to use some backspin and NOT topspin. For the second shot, you need a wood with distance and curl. You should be able to bounce before the rough over to the green. You can use the right side of the green to make the ball fall down to the left. If you make an eagle, BE HAPPY. If you get some tailwind, you can use left curl and max overpower to bounce at the end of the first fairway and hop over to the second. From there you'll have an open shot to the green and a possible albatross. You can land your approach on the green or bounce over the rough onto the green. This approach only applies IF you don't have the possibility to reach the green on your second shot. 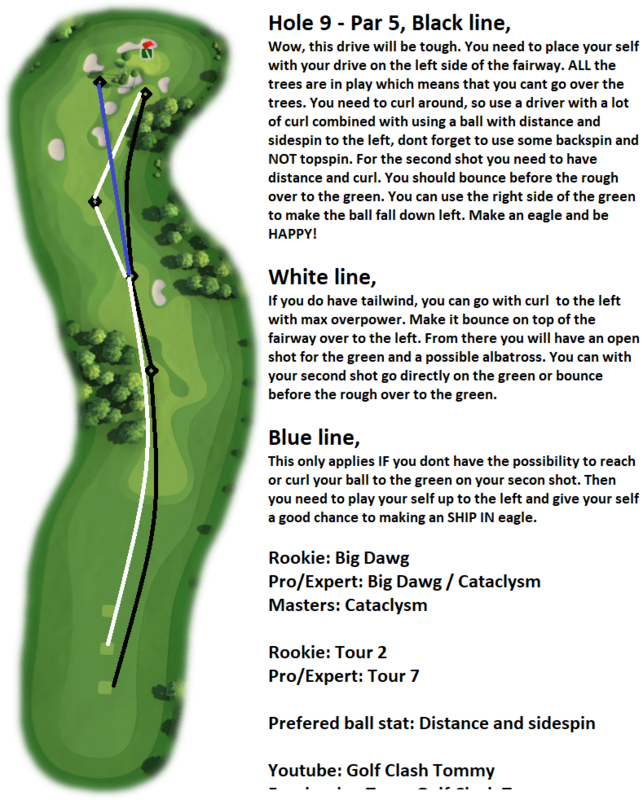 You can play your second shot up to the left and leave a decent chance to chip it in for an eagle.